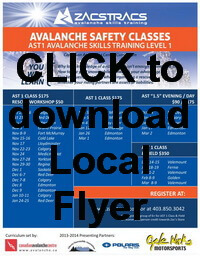 *Discounts up to $50* and *Credits up to $90* available when booking your AST Level 1 Class and Field at the same time. Youth discounts, Refresher discounts, group credits and early season credits are available! Please bring $20 cash for lunch and refreshments for the day! A course video will be watched over the lunch hour and everyone must stay in and eat. Details – This will be an indoor presentation and hands on introductory workshop. It is highly recommended, but not required, to BRING YOUR PERSONAL TRANSCEIVER, PROBE, SHOVEL, BACKPACK, AND WINTER GLOVES. Some demo units will be available. Please dress for the weather as we may take the opportunity to go outdoors for part of the program. If you should ever find yourself in the situation to need it, the transceiver search should be second nature, freeing your mind up for more complicated rescue needs. Learn how transceivers operate and methods to use when searching for multiple signals. Digital or analog….what is the best? Single search, multiple search…learn tips to improve speed and quality. Avalanche probes and shovels look pretty simple, but there are still important… READ MORE about Zac’s Rescue Workshop programs. It is recommended that you label all personal gear with your name to prevent loss. 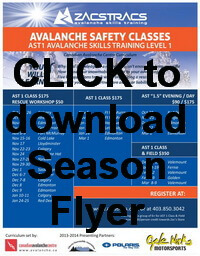 A certificate of completion for the AST1 is awarded to those riders that complete the hands-on mountain field session.